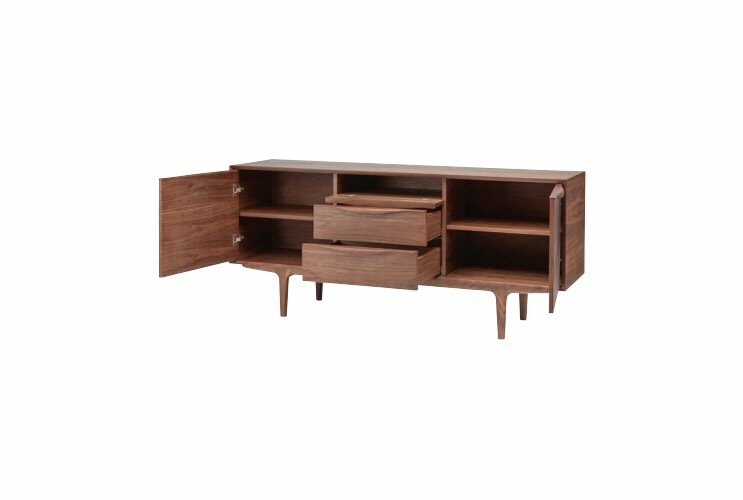 Nuevo Living Elisabeth Large Buffet unit is crafted to accommodate contemporary needs without sacrificing mid-century style. 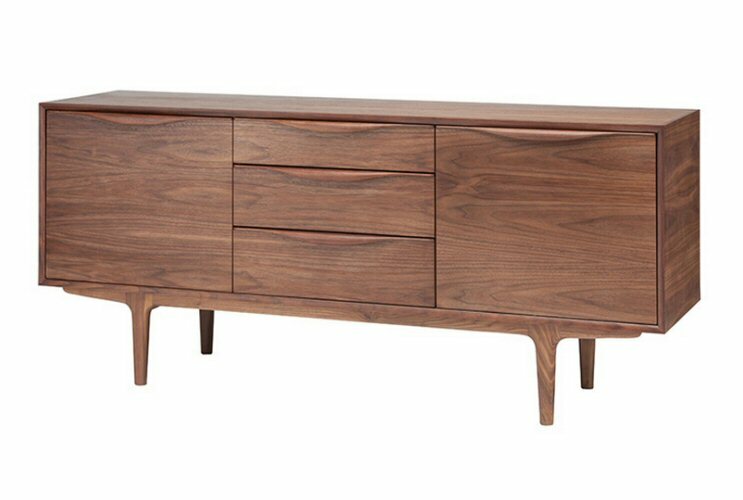 Available in American walnut veneer with solid hardwood edging, handles and legs, the Elisabeth has adjustable shelves. Nuevo Living is a prime resource for accurate, high quality designs inspired by the early to mid 20th century modern furniture classics. Mid century designers were particularly interested in using new materials in their furniture designs such as steel, molded plywood and plastic. They blended these new and innovative materials and methods with technology and art. The idea was to utilize materials that could be mass-produced, and therefore, make good design available to the masses. Ironically, today most of these designs are offered through licensing agreements with the estates of the designers at extremely high prices. Nuevo Living is a terrific alternative, as its' modern classic inspired furniture is both high quality and affordable, bringing the modern classics to the masses. Join our newsletter and receive exclusive offers and sale notifications, and learn the latest on the best in modern furniture. Some of our manufacturers restrict discounting, and therefore, this coupon does not apply to certain brands. We still hope you find a way to use this discount on our products that ARE included, however, you will not be able to use it on BDI, Copeland, Gus Modern, or Nuevo Living products. Discount cannot be used in conjuction with our price match guarantee or other sales and promotions. Modern Essentials has the right to refuse any redemption due to fraud, misuse or misrepresentaion of the program as determined by Modern Essentials. Promo code discounts may not be redeemed for cash and other terms and conditions may apply.